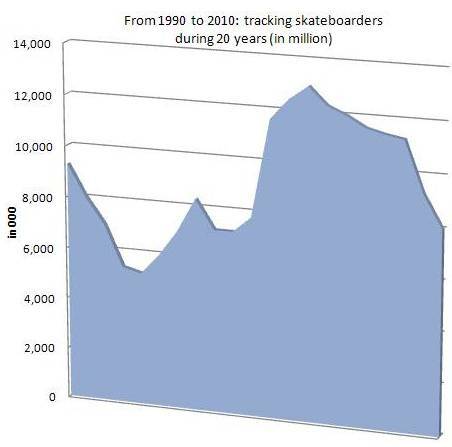 I Skate, Therefore I Am: Is skateboarding declining? A company like Vans has definitely understood the trend: Vans just signed on as the main sponsor of the 2011 Dragon Sk8 Series skateboarding contests in China. The series, which was founded two years ago by Wabsono International, will tour six major cities in 2011: Beijing, Shenzhen, Chengdu, Xi'an, Shanghai and Hangzhou and the Shanghai X-Games is this week-end. The US trend is definitely going downward and the industry’s main demographic has become older. However, according to Board-Trac, over the next five years, that prime demographic will begin to shift towards a younger consumer again and present more chances for retailers and brands to cater to this youthful group.